Lorraine and John Dineen welcome you to our home, Kent House Bed and Breakfast. Our house is a beautiful end of terrace Victorian Townhouse, built in the 1850’s originally as a Merchants Townhouse. It has gone through many changes since then , and is now our home. Kent house is a family run, family friendly Bed and Breakfast. The Bed and Breakfast consists of five comfortable spacious and tastefully decorated guest bedrooms, all en-suite. While staying at Kent House, you are ideally located to tour Cork City, the capital of the south of Ireland, and the surrounding area. We are adjacent to the Railway Station, the Bus Station is 5 to 6 minutes walk and the City Centre is within 10 minutes walk. It’s also convenient for the ferry port and the airport. Cork City is renowned for it’s top class shopping, excellent pubs, restaurants and theatres. 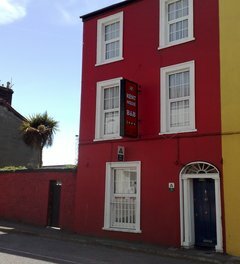 Bathroom : Private All Rooms are Ensuite Breakfast Style : Cooked Full Irish Breakfast included in Price. 6th house on the right after the Railway Station.